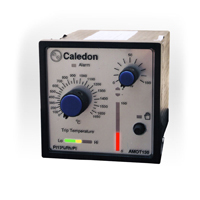 This instrument combines the functions of a furnace over-temperature trip and auto/manual station. If the furnace temperature exceeds the setpoint set on the left-hand temperature scale, the red 'alarm' lamp will light, and power to the furnace is removed until the temperature has fallen back within safe limits. The horizontal bargraph beneath temperature setpoint indicates the level of the furnace temperature relative to the cut-out setpoint. Normally two green LEDs will be lit, indicating that the temperature is more than 3% of instrument span below cut-out temperature. As the temperature rises the green LEDs extinguish, and when the furnace is on the verge of cut-out only the central yellow LED will be lit. If the temperature rises above the cut-out temperature 1 or 2 red LEDs will light and the alarm will come on. The bargraph must fall back to indicate yellow before the alarm is reset. If the thermocouple becomes open-circuit, the instrument will indicate an over-temperature, and the alarm will be activated. The vertical bargraph on the right of the instrument indicates the power being delivered to the furnace. If the small push button next to the hand symbol is out, and the corresponding lamp is unlit, this power is being controlled by the main temperature controller. If the button is pressed and the lamp is on, the furnace power is controlled manually by means of the small potentiometer. If the over-temperature trip is activated power to the furnace is cut and the power bargraph will fall to zero. When switching from auto to manual a 'bumpless' transfer may be achieved by setting the potentiometer to the same power level as the furnace is currently drawing before depressing the button. To do this adjust the potentiometer until the two illuminated arrows marked + and -, which indicate the relative levels of the main controller and potentiometer power demand, are both of equal brightness.